All over the world street artists have become famous by surreptitiously adding swabs of paint or wheatpaste to city walls. But the most remarkable thing about a new mural in Cairo is not only its size—it covers about 50 buildings—it’s that the artist managed to do it in a place that’s not known for encouraging creative expression. The New York Times has a wonderful story about eL Seed, a Tunisian artist who transformed a forgotten corner of Cairo into a work of public art—potentially the largest artwork in the city. 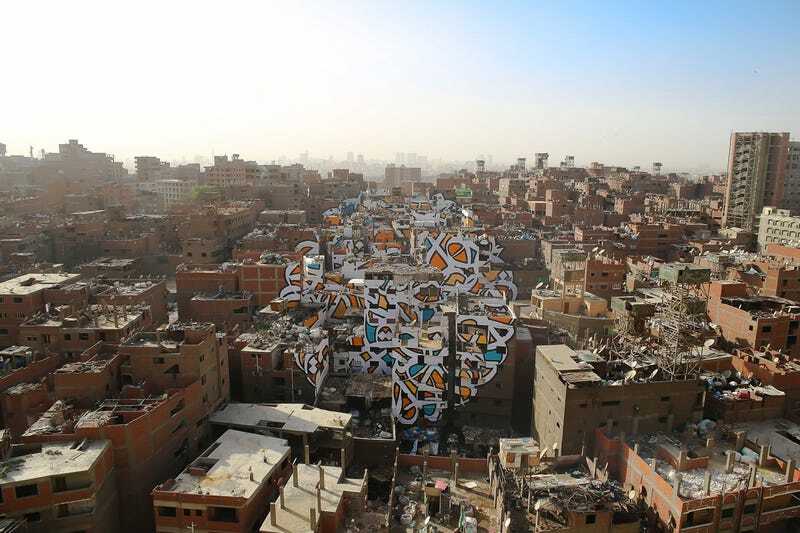 The mural honors Cairo’s garbage collectors, many of whom live in the high-rises which are covered with a snippet of the piece. It’s only by standing on a nearby hillside that you can see the art in its entirety. The piece itself is stunning, as are the artist’s intentions to uplift a marginalized community. But the amazing thing about the world we live in today is that you can see the entire story play out on eL Seed’s Instagram feed. Starting five weeks ago, you can see a few hints at what’s to come. Followed by some incredible process shots. And finally the big reveal, which, of course, looks different depending on where you stand (or where your drone flies).